Using only 18 distinct inputs, the models provide 106 months "early warning" compared to the theory-based Merton model, which performed very poorly out of sample during the credit crisis. The accuracy of the models is more notable given the sharp cyclical nature of defaults in the 2007-2010 period. The forecasting accuracy of KDP-jc5 relative to legacy ratings can be clearly seen in the table provided. This performance is critical as the timeframe includes the many defaults that occurred during the credit crisis. As can also be seen from the chart, the predictive accuracy advantage of the KRIS-jc5 model compared to ratings increases as one moves out on the term structure and looks at the longer time horizons. Many people have said that "all models failed during the credit crisis." Kamakura research concludes that very good models performed very well for this period. Poor credit models, such as the Merton structural model, performed poorly during the same period. "This result is very consistent with the near total failure of the Merton-based copula method for CDO valuation that is widely blamed for aggravating the credit crisis," reported Martin Zorn, Kamakura Corporation Chief Administrative Officer. "In a crisis, the lack of liquidity drives defaults so the balance sheet takes on increased importance. The reduced form framework takes advantage of this insight, while it is ignored in the Merton framework." 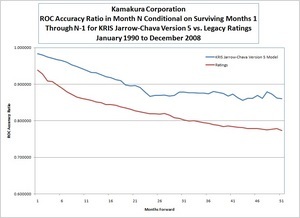 Kamakura continues to improve upon the forecasting accuracy of its models in predicting default as well as effectively classifying the riskiest companies. The KRIS default probabilities are available for 29,400 public firms in 37 countries. The KRIS service also includes implied ratings and credit default swap spreads for all 29,400 firms. KRIS default probabilities are available via the web site www.kris-online.com. KRIS default probabilities are also made available via the Reuters 3000Xtra service and Eikon for 4,000 firms and via file transfer protocol for KRIS "power users." The KRIS default probabilities are integrated seamlessly in the KRIS-cpm credit portfolio manager simulation engine embedded in KRIS. They are also seamlessly integrated with Kamakura's enterprise wide risk management system, Kamakura Risk Manager. In KRIS-cpm, forward looking default probabilities are driven by econometric links to macro-economic factors. In Kamakura Risk Manager, these linkages can be supplied by either the user or from the KRIS data base. These relationships define the degree of correlation between the default probabilities and events of default for all pairs of companies. For a demonstration of KRIS and a complete review of KRIS model accuracy, please contact info@kamakuraco.com. Founded in 1990, Honolulu-based Kamakura Corporation is a leading provider of risk management information, processing and software. Kamakura has taken Credit Technology Innovation Awards from Credit Magazine each year since 2008. In 2010, Kamakura was the only vendor to win 2 innovation awards, one each with distribution partners Fiserv and Thomson Reuters. Kamakura, along with its distributor Fiserv, was ranked number one in asset and liability management analysis and liquidity risk analysis in the RISK Technology Rankings in 2009. Kamakura Risk Manager, first sold commercially in 1993 and now in version 7.2, was also named in the top five for market risk assessment, Basel II capital calculations, and for "risk dashboard." 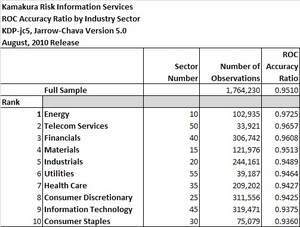 Kamakura was also ranked in the RISK Technology Rankings 2008 as one of the world's top 3 risk information providers for its KRIS default probability service. The KRIS public firm default service was launched in 2002, and the KRIS sovereign default service, the world's first, was launched in 2008. KRIS default probabilities are displayed for 4000 corporates and sovereigns via the Reuters 3000 Xtra service and the Thomson Reuters Eikon service. Kamakura has served more than 200 clients ranging in size from $3 billion in assets to $1.6 trillion in assets. Kamakura's risk management products are currently used in 33 countries, including the United States, Canada, Germany, the Netherlands, France, Austria, Switzerland, the United Kingdom, Russia, the Ukraine, Eastern Europe, the Middle East, Africa, South America, Australia, Japan, China, Korea and many other countries in Asia. Kamakura has world-wide distribution alliances with Fiserv (www.fiserv.com), Sumisho Computer Systems (http://www.scs.co.jp/english/), Unisys (www.unisys.com), and Zylog Systems (www.zsl.com) making Kamakura products available in almost every major city around the globe.